CHEBAA, Lebanon (AP) — Akram Kanaan looked toward an Israeli military position on a snow-capped mountain that overlooks the village of Chebaa in southern Lebanon, pointing toward the scenic area captured by Israel more than five decades ago. No matter how long it takes, he said, it will eventually return to Lebanon’s sovereignty. Like many others in this area where the borders of Lebanon, Syria and Israel meet, Kanaan — a member of Chebaa’s municipal council — is angry about US President Donald Trump’s decision to recognize Israel’s sovereignty over the Golan Heights, seized from Syria in the 1967 Six Day War and effectively annexed in 1981. The American president had no right to give Israel lands that belong to Syria and Lebanon, he said. “These are Arab territories that will be liberated sooner or later the way the south was liberated,” said Kanaan, standing near Chebaa’s main school as its buses left the compound at the end of a school day. Trump’s move last month has caused concern among Lebanese officials that it would mean also recognizing Shebaa Farms and nearby Kfar Chouba hills, captured along with the Golan, as Israeli territory. Lebanese President Michel Aoun said the US recognition undermines Lebanon’s claim to the territory. The origin of the dispute over ownership of the Shebaa Farms dates back to the French colonial period, when France drew maps of the area without officially demarcating the border. Following an 18-year operation, Israel withdrew from south Lebanon in 2000, but held on to the farms. Hezbollah claimed the withdrawal to be incomplete and demanded, along with the Lebanese government, that Israel withdraw. Israel rejected the demands, saying the land was Syrian when it was captured in 1967. Syria has held an ambiguous position and generally refuses to demarcate the border before Israel withdraws from the Golan. The UN, which doesn’t recognize Israel’s sovereignty over the Golan, has said Lebanon’s claim is to be settled along with the Golan’s fate. Although most Lebanese agree that the Shebaa Farms and Kfar Chouba hills are part of their country, anti-Syrian politicians have suggested it serves as a pretext for Hezbollah to hang on to its weapons and have called for the demarcation of the Lebanon-Syria border, a demand repeated by Prime Minister Saad Hariri on Wednesday even as he said the territory is Lebanese. According to Kanaan, the total size of the Lebanese area still held by Israel since June 1967 is about 250 square kilometers (96 square miles) or about 2.5 percent of Lebanon’s total territories. Kanaan said the area is owned by Lebanese citizens and that many of them have documents proving their ownership registered in the Lebanese coastal city of Sidon, the provincial capital of south Lebanon. Arab countries have unanimously rejected the US recognition of Israeli control over the Golan, calling the Trump administration’s policies unfairly biased toward Israel. On the edge of Chebaa, shepherds were seen taking their herds of sheep and goats near a fence built by Israel. About every 100 meters (109 yards) white and blue barrels marked the so-called blue line, or the border that the UN drew after Israel’s withdrawal in 2000. The area has been calm since August 2006, after a UN Security Council resolution ended a 34-day war between Israel and Lebanon’s Hezbollah terror group. Soldiers at Lebanese army checkpoints on roads leading to Chebaa and Kfar Chouba checked the identity cards of people visiting the area to make sure no strangers enter. White UN vehicles with light blue flags could be seen along the fence that marks the border. 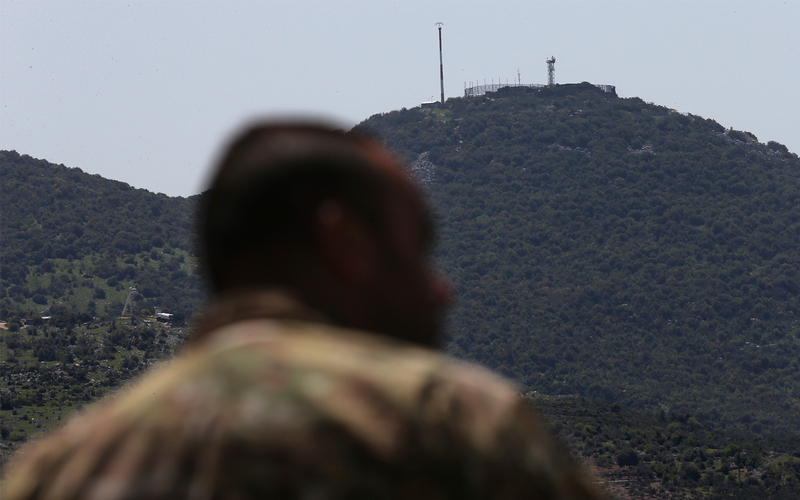 Andrea Tenenti, spokesperson for the UN force in southern Lebanon known as UNIFIL, said the issue of Chebaa is one that is “discussed in New York at UN headquarters and not part of our mandate. Nevertheless, the position of member states is not necessarily the position of the United Nations,” Tenenti said when asked about Trump’s decision. “Nothing has changed, and we are continuing with our work in the south of Lebanon, to monitor the cessation of hostilities and to work closely with the Lebanese army,” he said. “With deep regret, this guy who is called Trump who is the president of the United States of America, the most important country in the world, is acting like a thug,” said grocer Riad Khalifeh, who was 23 when Israeli forces captured the hills overlooking his hometown of Kfar Chouba in 1967. “Who gave you the right to give a land that belongs to me or to Palestine or to Syria to an enemy that is occupying it?” Khalifeh asked. 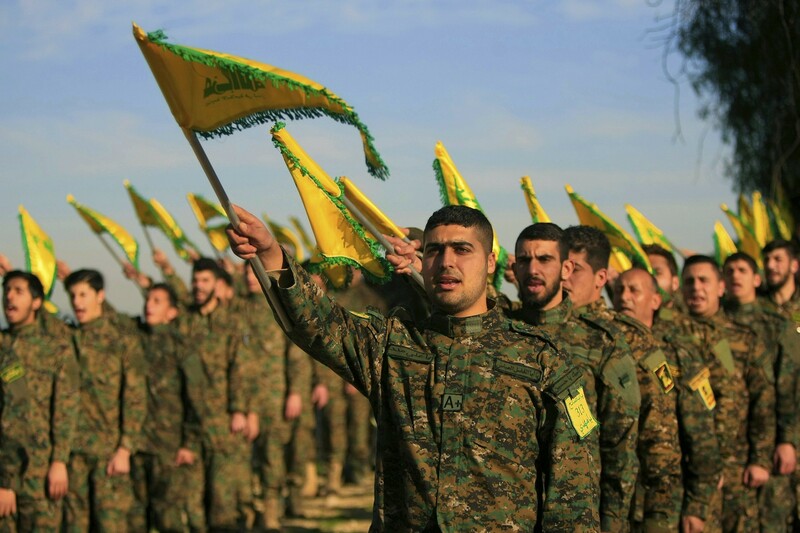 WASHINGTON – US officials on Thursday announced sanctions on a Lebanese network accused of laundering millions of dollars for “drug kingpins” and helping finance Hezbollah, the Iran-backed Shiite movement that Washington labels a terrorist organization. “Kassem Chams and his international money laundering network move tens of millions of dollars a month in illicit narcotics proceeds on behalf of drug kingpins and facilitate money movements for Hezbollah,” the Treasury said in a statement. US President Donald Trump’s administration has accused Iran of taking provocative measures to destabilize the Middle East. 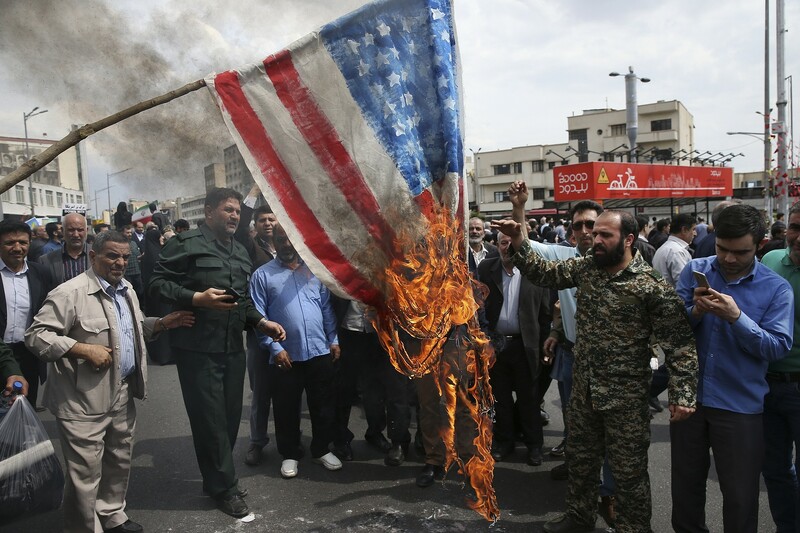 TEHRAN — Iranians rallied on Friday against the US’s decision to designate the country’s powerful Revolutionary Guards as a foreign terrorist organization. Also Friday, Foreign Minister Mohammad Javad Zarif sent a letter to the UN Security Council and Secretary-General Antonio Guterres stressing that Iran would hold the US accountable for any future provocations against the Iranian Revolutionary Guard Corps, or IRGC. “The provocative move will raise tensions to an uncontrollable level and increase threats in the region,” he said, adding that the Revolutionary Guard is at the forefront in fighting terrorism and extremism. The Islamic Revolutionary Guard Corps was formed after the 1979 Islamic Revolution with a mission to defend the clerical regime, and the force has amassed strong power both at home and abroad. The Guards’ prized unit is the Quds Force, which supports Iran-backed forces around the region, including Syrian President Bashar Assad and Lebanese terrorist group Hezbollah. US Secretary of State Mike Pompeo wished a “mazal tov” Thursday night to Prime Minister Benjamin Netanyahu for his victory in the Knesset elections. 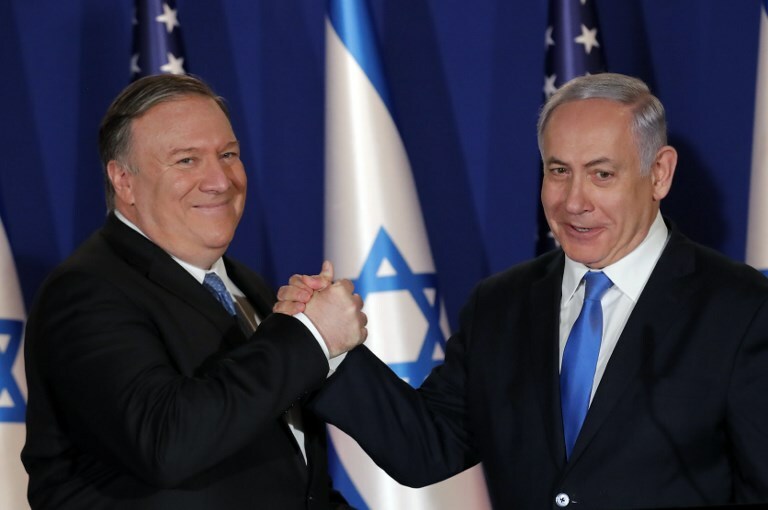 “Mazal Tov to PM @Netanyahu on his re-election, and to the people of #Israel on exercising their freedom to vote,” Pompeo tweeted early Friday morning, hours after the all-but-final results showed Netanyahu well-placed to form a stable, right-wing governing coalition. “The U.S.-Israel alliance is unbreakable. We will continue to work together to address common threats and strengthen the bond between our democracies,” Pompeo added. According to a Central Elections Committee announcement late Thursday night, with all of the votes counted, checked and rechecked, Netanyahu’s Likud party edged past its rival Blue and White party with 26.45 percent of the vote to win 36 seats in the 120-seat Knesset and head a potential 65-strong coalition. Earlier in the day and on Wednesday, as the drama over the vote countdragged on in the Knesset, congratulations to Netanyahu poured in from world leaders, especially those who have a close and personal relationship with the prime minister. As of Thursday evening, Netanyahu had taken congratulatory calls from US President Donald Trump and his VP Mike Pence, Austrian Chancellor Sebastian Kurz, Hungarian Prime Minister Viktor Orban, Cypriot President Nicos Anastasiades, Bulgarian Prime Minister Boyko Borissov, Guatemalan President Jimmy Morales and Honduran President Juan Orlando Hernández. Honduras recently declared its intention to open a trade mission in Jerusalem, promising to move its embassy to the city as soon as Israel opens a mission in Tegucigalpa. The leaders of countries the prime minister recently touted good ties with, such as Poland, Chad and Russia, have not yet called to congratulate, but are expected to do so either after the final election results are announced, or when the new government is sworn in, which will likely take place in several weeks. Brazilian President Jair Bolsonaro, who visited Israel just a few days before Israelis headed to the polls, congratulated the “great leader” Netanyahu in a tweet. Congratulations to my friend @netanyahu on #israelelections2019 results. Israeli votes in parliamentary elections is the best evidence of people’s support of the government under your leadership! The leaders of France, Britain and Germany were expected to issue congratulations in the near future. Austria’s Kurz was the first to send good wishes to Jerusalem, tweeting his congratulations “for an excellent showing” on Wednesday around noon. “While the official results have not yet been published, one matter is clear: you have — once again — gained the trust of the people of #Israel in record numbers,” he wrote. “My dear friend Bibi, Congratulations! You are a great friend of India, and I look forward to continuing to work with you to take our bilateral partnership to new heights,” he added in a second tweet. Milos Zeman, the president of the Czech Republic, sent a lengthy congratulatory letter to Netanyahu. “I am pleased that the Israeli people have confirmed their agreement with your political agenda and renewed your mandate, giving you the opportunity to continue to shape not only Israeli politics but also to participate in regional and international affairs,” he wrote. Presidente @JuanOrlandoH llama al Primer Ministro de Israel Benjamín Netanyahu para felicitarlo por su reciente victoria electoral. Trump called Netanyahu from aboard Air Force One. “Prime Minister Netanyahu thanked US President Trump for his great support of Israel, including the recognition of Jerusalem and the Golan Heights, as well as for the strong stand against the Iranian regime, including the President’s recent decision against the Iranian Revolutionary Guards,” the Prime Minister’s Office said in a statement Wednesday. Saudi Arabia is preparing for the launch of the so-called “Arab NATO” — the Middle East Strategic Alliance (MESA) — in an effort to combat Iranian hegomony in the region. The US administration has since last year been exploring the creation of a new security body comprising Sunni Middle Eastern countries that would be geared toward countering Shiite Iran’s regional adventurism. Reportedly, MESA member-states would seek deeper cooperation in the realms of missile defense, military training and counter-terrorism, while strengthening broader political and economic ties. 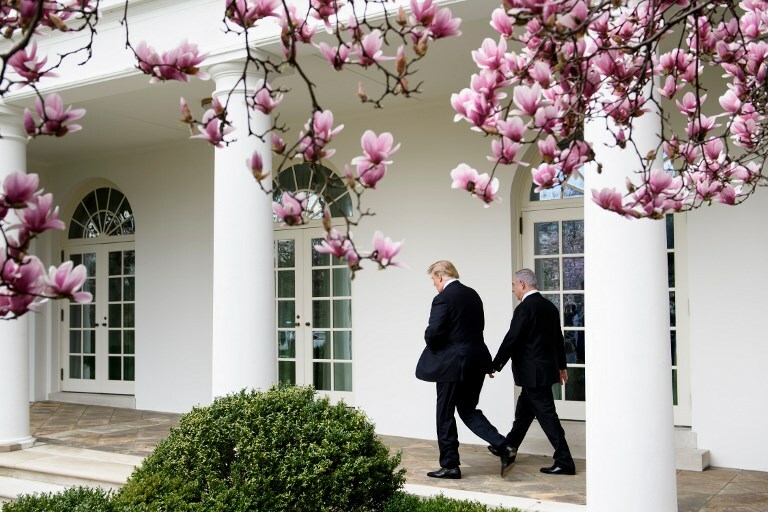 “It would serve as a bulwark against Iranian aggression, terrorism, extremism and will bring stability,” a spokesperson for the White House’s National Security Council asserted in reference to the potential association last year. For example, Qaseer says that the Arab countries don’t agree on more than one critical issue, pointing out that the Arab NATO is still an idea with no structure. Regarding Israel, its relations with regional Muslim nations are by most accounts improving, primarily the result of a shared interest in curbing Iran’s potential nuclearization. However, the conflict with the Palestinians remains a major, if not insurmountable, obstacle to the establishment of full diplomatic ties between Israel and more of its neighbors. The 2019 elections are over. Officials may yet be recounting votes, but nothing will change the fact that Benjamin Netanyahu has well and truly beaten the generals, the pollsters and the sourpusses. With 1,138,772 votes cast for Likud, Netanyahu’s party is the first in Israel’s history to cross the one-million-ballot threshold. Will the reelected prime minister be able to hold onto his seat even if he is indicted for bribery, fraud and breach of trust? Will his renewed right-wing coalition be able to block the peace process, or will the Washington plan threaten his coalition stability? 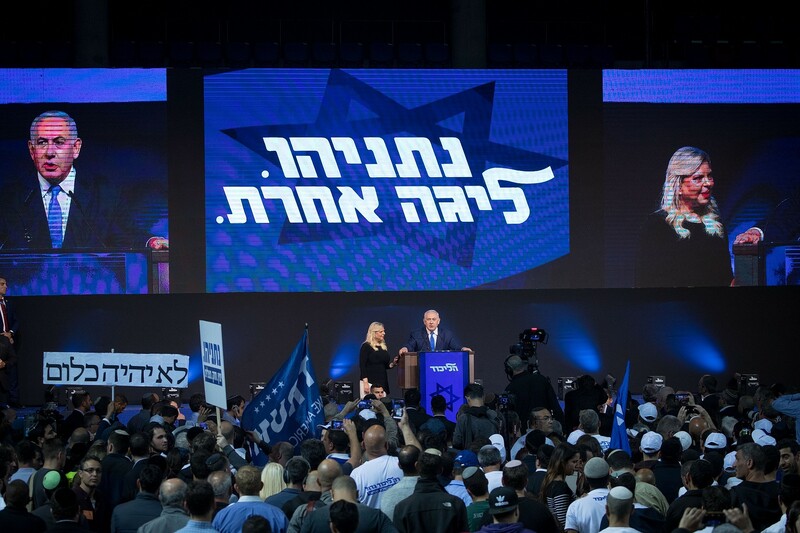 And will Netanyahu succeed in becoming a prime minister for all of Israel’s citizens — as he promised in his rather conciliatory winning speech — when he is so dependent on a coalition composed of radical right-wing and ultra-religious parties? Ultimately, Netanyahu understands the value of his one million voters, and knows exactly where to invest them: in his own political survival. The prime minister is now assembling a coalition that can prove loyal throughout his legal hearing process and even — if an indictment is served — while he stands trial in the Jerusalem District Court. After his unprecedented win, and with contrarian Likud MKs Benny Begin and Oren Hazan out of the picture, Netanyahu has all 36 party members at his beck and call — none will dare to disobey or challenge him. 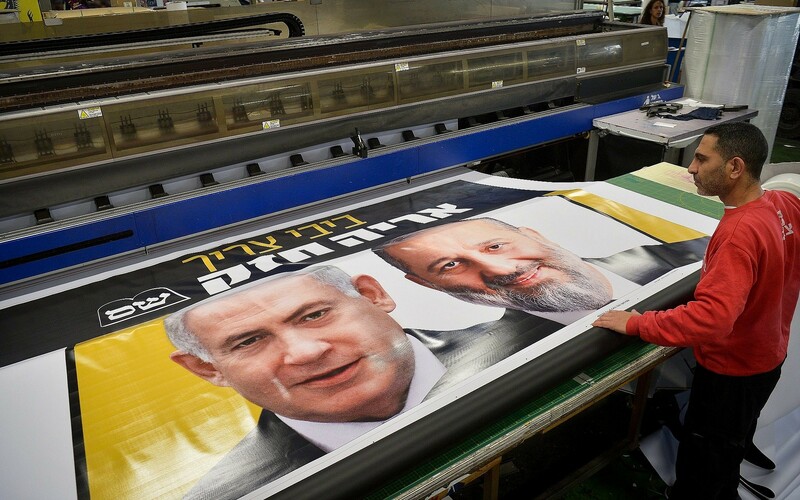 The ultra-Orthodox parties are also tightly bound to Netanyahu — come hell or high water or budget cuts — giving him 15 more seats of unconditional loyalty. The Union of Right-Wing Parties, with five seats, is also allied to the premier, who can be counted among its founders. Meanwhile, Avigdor Liberman’s Yisrael Beytenu, also with five seats, may not be quite as beholden to Netanyahu, but Liberman loathes law enforcement agencies just enough to support the prime suspect. As for Kulanu, with just four seats: Netanyahu is likely to take advantage of Moshe Kahlon’s deflated party and shaky situation to offer the former Likud MK a carrot and a stick: retain the Finance Ministry and assimilate Kulanu into the Likud mothership, thus guaranteeing the prime minister full political obedience. Kahlon knows firsthand how demanding his old party leader can be; after all, he was once Likud’s central committee chairman. Netanyahu’s victory speech delivered a clear message to law enforcement authorities: He won overwhelming national support, despite detailed and severe allegations of wrongdoing by him published by Attorney General Avichai Mandelblit just weeks before the elections. “One million people voted for us, so one civil servant will not sway public opinion,” a source close to the prime minister told The Times of Israel on Thursday. It won’t be an easy battle for the gatekeepers — both before and after the looming pre-trial hearing. Netanyahu, by the way, is confident he has extraordinary powers and will therefore have no problem standing trial while running the country — and may even continue to moonlight as defense minister. 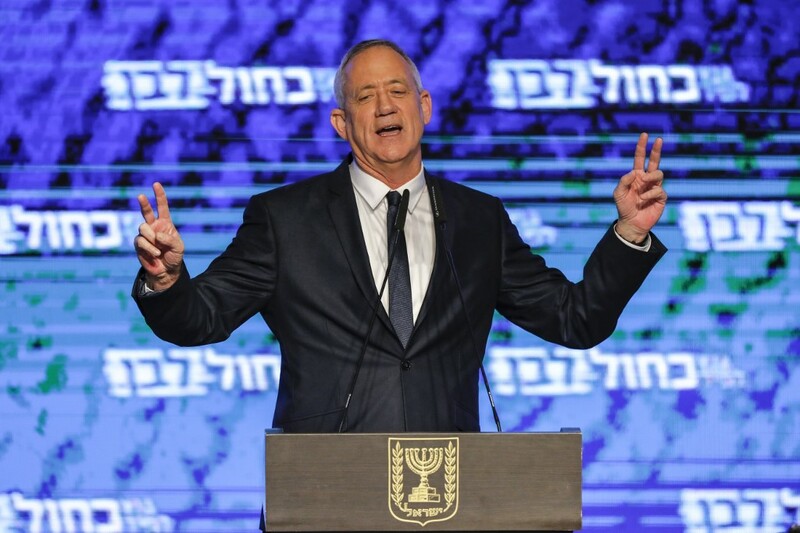 Benny Gantz jumped the gun when he boasted about his party’s “historic achievement” in a premature victory speech. Now, the only “achievement” he can claim is the decimation of the Zionist left, and possibly any opposition to Netanyahu. Gantz and his Blue and White partners were unable to breach the insular right-wing bloc and effectively did not draw any seats from that side of the aisle. They did, however, destroy the Labor party, its spirit and leadership, leaving it with just six seats — an insignificant force even in Israel’s already shriveled opposition. And if that were not enough, Blue and White also dented Meretz, completely ignored the Arab parties, and offered no alternatives to the nation-state law, thus contributing to an incredibly low Arab voter turnout. Gantz’s partner Yair Lapid now talks about building an opposition that will “make this government’s life miserable,” but in reality, Blue and White is an ad hoc political alliance, composed of three different parties, that will disband sooner or later during this term. In over four decades of covering politics, I have seen many centrist parties come and go. None survive. In 1977 it was Yigal Yadin’s DASH party, later came the Merkaz party and Tomi Lapid’s Shinui, and then there were Kadima and several others — all long forgotten. As Shimon Peres once said, there is no third option. And Netanyahu, who successfully dismantled rivals Kadima and Labor in the previous decade, is not very bothered by the threat posed by his new and inexperienced rivals. According to sources close to Netanyahu, Trump is set to propose a convenient peace plan for Israel. The plan will stipulate that Area A in the West Bank (which the Palestinian Authority already controls fully) will become the land for the Palestinian state, along with some East Jerusalem neighborhoods that will be excised from the capital’s municipal borders. The Palestinians are not likely to accept such an offer, but Netanyahu could play the unity card and call for the opposition to support him in the peace process. He will find, in such a case, that the real opposition is within his own bloc, and his coalition partners will veto any such move. This takes us back to Netanyahu’s legal battle: He’s so invested in his indictment-busting coalition that there is little chance of promoting any peace plan — even if it is likely to be the most accommodating settlement Israel will ever receive, from the most accommodating president Israel has ever seen.